On the radar. – Dirty wet dog , boats and sailing. In this post i want to return to a couple of themes which i have touched on before and specifically a prolific design house that i have mentionned before ie E. G. Van de Staadt and some of their many designs. Alongside that i have also continued the search for a shallow draught cruiser along older race-boat lines. In this case the boat is also one that i just like the look of and that goes a long way with me. The boat on the radar today is an old plywood boat designed by Van De Staatd and built by the ‘Waarschip’ factory and is in fact a Waarschip 725 quarter-tonner as far as i can tell so first its a ply multi-chine design, by all accounts actually clinker-ply and a hell of a lot more attractive than many others of this type and in the right hands a quick little boat with one of these at least represented in the quarter ton fleet (Love in a mist). Here is a short video clip of that boat, and as always all rights go to the original author. I must say this boat looks pretty relaxed in a force 6 with all plain sail up. The same boat appears several times in the quarter-ton cup series and in a video of the round the island race and it does seem to sail well. It just so happens that the boat on the radar this month is a Waarschip 725 and i must say that i like the look of this little boat, its just about the smallest boat that i would consider now as a project cruising boat and yes i could well imagine the horrors of a 40 year old pre-epoxy plywood hull !, although its entirely possible that the oly could be in very good condition as from the facts i can garner these boats came out of a pertnership between Van De Stadt and the maker of Bruynzeel marine ply. Anyway justone glimpse of something a bit interesting and i am away with the internet for hours of boat research. I have just found a website of one of these of similar age being restored so i will link that below. I am fascinated by boats of this era : from the late Eric Tabarly’s early lightweight designs to boats like Black-Soo and Zeevalk. Here is a model and lines drawing of Black Soo. 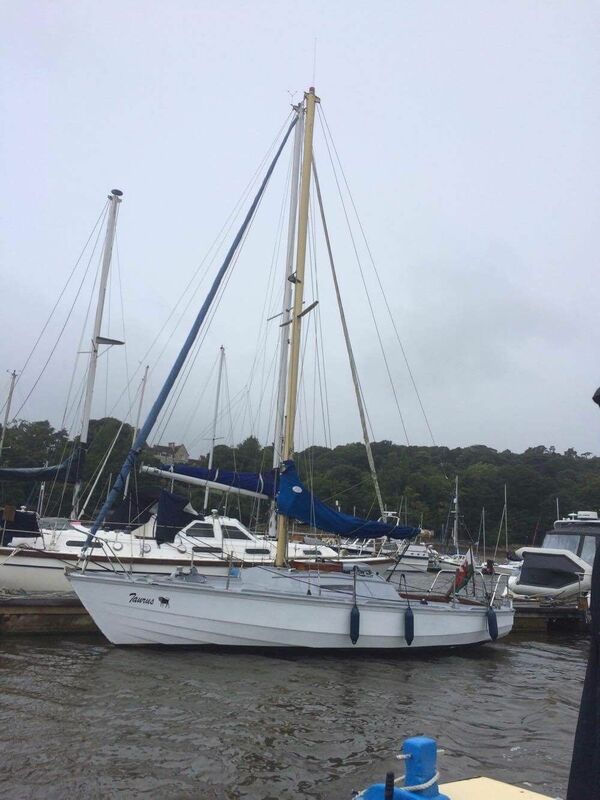 Back to the design house though and a quick mention of some other Van de Staadt designs that i have looked at : regular visitors should immediately recognise this one which is the Dehler 25 trailer sailer with lifting keel and some water ballast. The Dehler is still on the ‘look at’ list for this autumn by the way as it still mostly fits the bill for what i want in a small cruising boat : similar size but higher internal volume, a more modern shape and a lifting keel but it is to be remembered that these designs are some 15 years apart and the later IOR influence can be seen in the Dehler. The Van De Stadt design office has been a prolific producer of small cruising boats and cruiser-racers and its my impression that the designer led the way in breakthrough design as i have posted before with boats such as Black-Soo and Zeevalk : relatively long and slim boats with deep fin keels. This continues my interest in the possibilty of doing a refit/restoration of a cruiser-racer style boat from this era, as i have said before i am familiar with small and feisty quarter-tonners although the Waarschip does seem a more seamanlike boat than many later IOR quarter ton designs which are pretty extreme in IOR terms and pretty flimsy boats to boot. The size is something that wouldn’t break the bank to start with and the possibility is there of getting a space inside a shed if it was a matter of stripping the paint off and maybe epoxy/glass coating the hull. That level of work is something that i think i could deal with and i can several ways of making a functional interior with the quarter berths as sea bunks , maybe a cross-hull double for in port and something that i have always thought of doing which is to have a moveable/stowable galley and an empty forepeak. Here are some early factory drawings of the Waarschip which give a good impression of the size. One thing i have been thinking about a lot is how to achieve the compromise of offshore stability in a small boat while still keeping shallow draught and the ability to dry out. The fin keel is the stumbling block with most IOR boats especially as the keels became longer and narrower, with the little Waarschip i think there are 3 different keel designs with a deep fin keel and maybe 2 shallower bulb style keels : i can easily imagine sailing the shallower bulb keel version and adding a couple of beaching legs. Finally for now here are a couple of pictures of nicely restored Waarschips. Love the bright yellow one ! Next Down at the yard.